Use MRO threadlockers on any fastener when you need a secure connection. One drop prevents loosening, even under vibration. Hardening begins in about 5 to 15 minutes, and full cure time is about 24 hours. Threadlockers also seal threads against leakage and prevent rust and corrosion. Temperature range is -65 to 300°F. 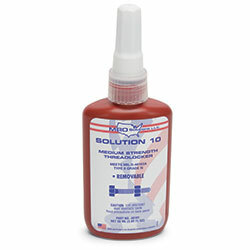 MRO Solution 10 is a medium strength, general-purpose threadlocker for stainless steel and most metal fasteners between 1/4" and 3/4" diameters. It is removable with hand tools. Fills spaces up to 0.01". Meets MIL-S-46163A Type II Grade N specifications.